VAT4U offers the possibility to import expenses instead of entering expenses one by one. 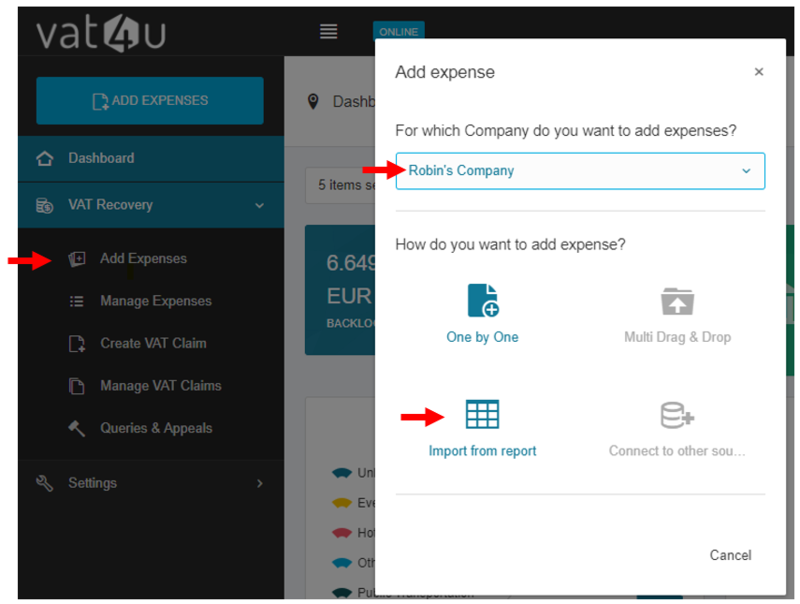 This feature can be very useful if your company is having data availabe from an ERP or a travel expenses software for example. In addition, some users prefer to inject data in Excel and import this file into VAT4U. Tip: any import is revertible. This means that if something goes wrong or your raw data was wrong, you can simply revert the mass import (cancelling all the expenses imported in the document). VAT4U can import .csv files in a certain layout. This file can easily be created from Microsoft Excel (you simply need to save the file as CSV (comma delimited) (.csv). How to complete the Excel layout? What is the first field LINE_CODE? For single item expenses (one category per invoice), the LINE_CODE is always 101. When you are done, save your file as CSV (comma delimited) (*.csv). When your file is finished, you can click on "Choose File" or drag & drop it into the corresponding field. Then click "Send file for processing"
After the import you can see the list of imports below. If something went wrong with your import, you can just click on "Revert" and all the expenses are deleted from the system again. After a successful import you will find your expenses on the "Manage Expenses" page.